Living in Texas, I feel as if Fall never even happened. It’s like one minute, I was in a crop top and flip flops counting down the days until pumpkin spice season and then the next minute I’m piling on the layers, getting ready to build my igloo. What’s up with that?! What happened to the 3 months where I get to obnoxiously wear every pair of leggings I own, paired with riding boots, cute sweaters and all things burgundy? I feel cheated, nooooooot cool. What I love most about this soup is that it’s ridiculously easy to make. No, seriously guys. You just have to throw your cooked sweet potatoes in a blender with a few other ingredients, heat it up and your’re all set for a day of comfort food perfection. 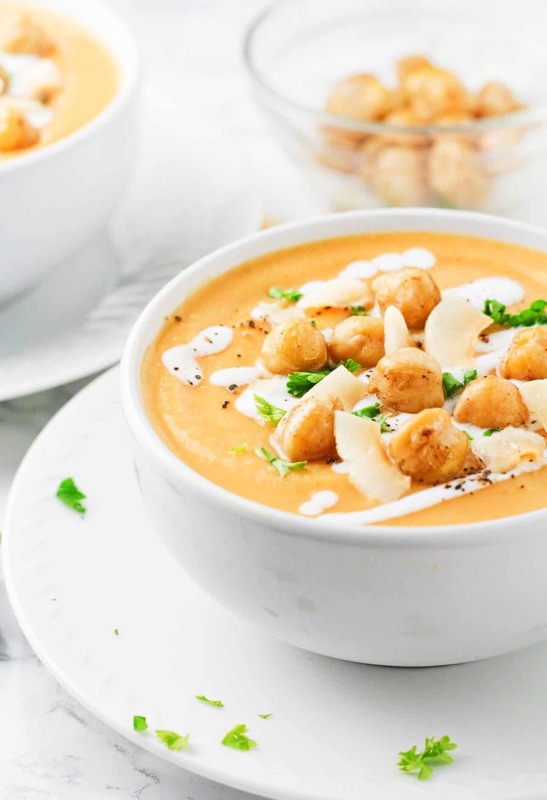 This super creamy Coconut Sweet Potato Chickpea Soup is bursting with flavors. It's the perfect clean eating, cold weather comfort food! Cut the sweet potatoes into medium sized cubes and add to a saucepan with water. Cook on high heat until the sweet potatoes are tender and can be easily pierced with a fork. Drain the sweet potatoes and add to a blender. Add can of drained chickpeas, coconut milk, vegetable broth, cumin,nutmeg, salt, black pepper and garlic powder. Blend until completely smooth. *( at this time, feel free to gradually add the water to adjust the thickness of the soup to your taste). Pour the soup into a saucepan and warm on medium heat for approx 5 minutes, stirring frequently. Pour into soup bowls with optional toppings and enjoy! Toppings are totally optional, but always a good time! Feel free to use roasted chickpeas, nonfat Greek yogurt, coconut flakes and chopped parsley.